Spooky plastic Tombstones Graveyard Cemetery Headstones with assorted humorous messages conceal approx 16-pieces of tiny white bone-shaped fruit flavored sweet tart type hard candies hidden inside. Fun school or Halloween trick-or-treat giveaways!!! Even makes nice place settings or cake decorations for medical students, Halloween, retirement, or over-the-hill party! Great craft supplies for gothic theme gifts or doll-size miniature cemetery graveyard scenes! Change the names to anything you want with your own customized stickers to add a personal touch! 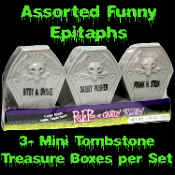 Each individually wrapped package contains three gruesome gray tombstones with different funny names. Rest In Pieces Candy Bones candies are great decorations and favors for any Halloween costume party, great handouts for Trick-or-Treaters, Over-the-Hill, or anytime a gothic-style treat is warranted. Packed 3-assorted to a sleeve. Murky Gray Gravestones, approx 3-inches tall x 2-1/4-inches wide. Miniature realistic cemetery-style boxes, features a dimensional Skull with bat wings and roses in his teeth. Can be re-used to hold a myriad of mini treasures once the candy is gone. Design titles and sayings may vary. Ingredients: Dextrose, Glucose Syrup, Citric Acid, Artificial Flavors, Color Added, Titanium Oxide, Magnesium Stearate, Carnauba Wax. Dr. Acula, Ima Ghoul, Myra Mains, Yule B. Next, Barry M. Deep, Rosa R. Dead, Bitby A. Snake, Daisey Pusher, Frank N. Stein, Juan Toomany, Diane Rott, etc.